Mike and Miriam Risko and the Mike Risko Music School welcome the opportunity to work with local organizations and provide free musical entertainment and other musical services. Having both grown up in Westchester County, Mike from Yorktown and Miriam from Ossining, they enjoy giving back to their community. Mike and Miriam have provided live music and other musical services for the following organizations, to name just a few, Briarcliff Manor Education Foundation, Ossining Matters, Croton on Hudson Education Foundation, Tarrytown Education Foundation, Pocantico Hills Education Foundation, Rock 2 Rebuild, Ossining PTA, Congregation Sons Of Israel, CSI Nursery School, The Juvenile Diabetes Foundation, The Ossining Democratic Party, Richard Wishnie, Sandy Galef, The Make a Wish Foundation, D.A.R.E, The Village of Ossining, Croton Recreation, JCYS Baseball, The Ossining Lions Club, The Ossining Chamber of Commerce, Chappaqua Chamber of Commerce, Briarcliff Chamber of Commerce, Ossining Girl Scouts, Ossining Little League Football, The Briarcliff Rotary Club, The People's Caucus of Briarcliff Manor, The Westchester Ballet Company, Green Ossining, The Ossining Drama Club, The Ossining Junior State of America Club, Sunshine Children's Hospital, The Ossining Historical Cemetary Conservancy, and many, many more. In addition to providing music, Mike and Miriam enjoy working with organizations in the community. Mike is currrently a member of the Ossining Arts Project and on the Executive Board of the Ossining Chamber of Commerce while Miriam is on the Executive Board of the Ossining PTA Council as well as secretary of the Ann M Dorner Middle School PTA and the Ossining High School PTSA. Miriam is also a Girl Scout Leader. If you are looking for something special for your group or school, please contact us to see if we can provide you with the what you are looking for. We are also happy to donate sevices and musical items for raffles and silent auctions that benefit a local cause. Please fill out the form on this page and we will contact you right away. We look forward to continued partnerships with local organizations. At an event honoring County Legislator Richard Wishnie at The Kittle House in Chappaqua in 2006. With Melissa at the Croton Education Foundation Fundraiser at Croton Point Park in 2005. Mike and Miriam at Ossining Matters Education Foundation Gala on April 18th 2009. Picture taken by David Silbert. 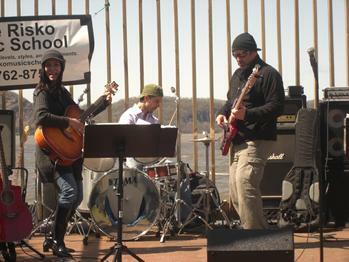 Find out about the Mike Risko Band helping the Ossining High School Drama Club to raise money for their trip to Europe! Read the article in The Daily Voice here. Read the article in the Daily Voice here about the MIke Risko Band's visit to Sunshine Children's Hospital. Thank you for filling out the Mike Risko Music Donation Request Form below. We appreciate you reaching out and are always happy to help local organizations. Having a strong and positive relationship with our community is important to us and we always look for ways we can give back. Make sure to specify what you are looking for, for example do you need live music or a physical donation like a gift certificate or an item from our store? We get many requests throughout the year and we try to help in some way. Please give us advance notice of live performance requests since we have a limited number of engagements we can participate in throughout the year. Thank you for including us in your cause. If this request is for live music, please describe the event here and include date and time. If this request is for a musical item or a gift certificate for a raffle or silent auction, please speicfy here along with event date. Please provide us with a short description about the organization you are working with and how this dontation will help. Please include any other information that would be relevant to this request. At Rock2Rebuild in White Plains, March 2005. 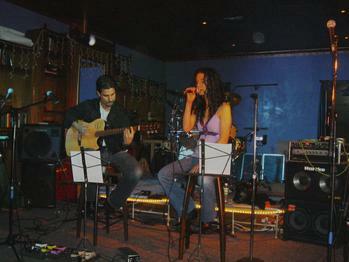 Mike and Miriam played for Hillary Clinton at an event run by Sandy Galef in 2004.